As the demand for housing persists, Community Support Services continuously strives to meet the call. The most recent collaboration, Stoney Pointe, brings together Community Support Services, AMHA, National Church Residences, and Tober Development. The project has been awarded tax credits to begin Phase 2 of the development for additional units. 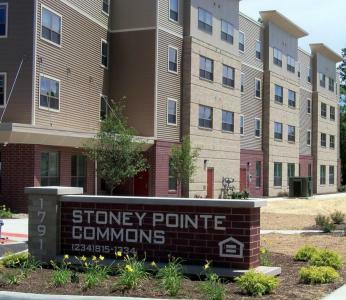 Stoney Pointe features 68 one-bedroom units with 51% of the units dedicated to individuals who are homeless. The apartments, approximately 600 square feet, feature a contemporary design including radiant floor heating and polished concrete floors. The building will feature 24-hour front desk staff, comprehensive social services, computer lab, training kitchen, community pantry, on-site laundry, enclosed bike storage, and a great room. To apply for Stoney Pointe, please complete an application through Akron Metropolitian Housing Authority.